I had such a good time making the first one that I decided to make another. 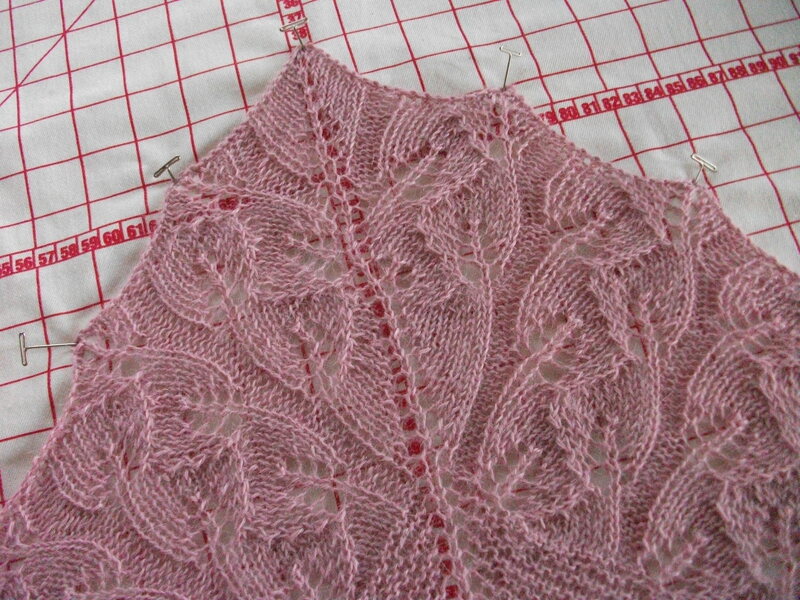 This time I found a cotton/viscose blend in a DK weight in my stash. I used my size 7 circular Signature Art Needle. It worked great. There was not the catching problem that usually goes with this type of yarn. The needle was smooth. The cable was smooth. The join was smooth. What more do you want? Actually, what I want is more sizes. But, I can wait. They’re worth it. 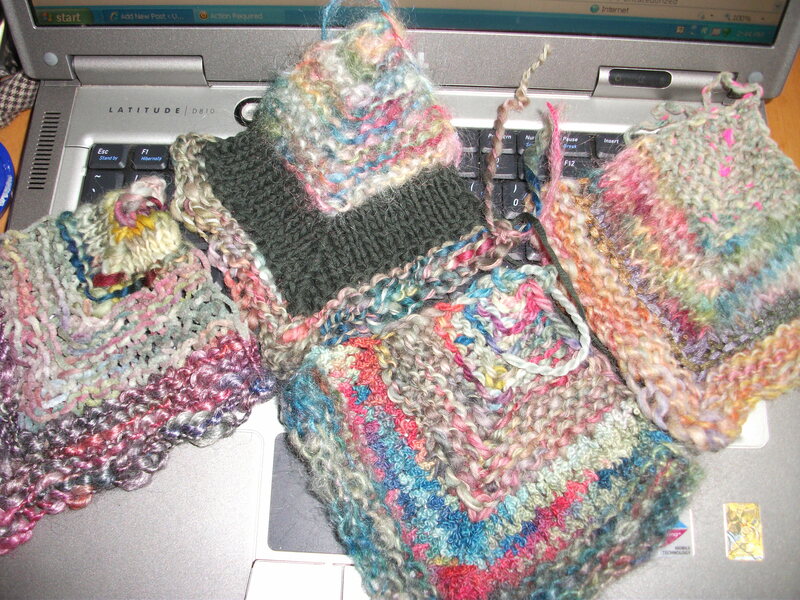 I knit until I almost ran out of yarn. Luckily, it was at the end of a leaf. I had three small skeins that were 110 yards each. Then I found four more in a beautiful aqua/turquoise/teal so I started another one. 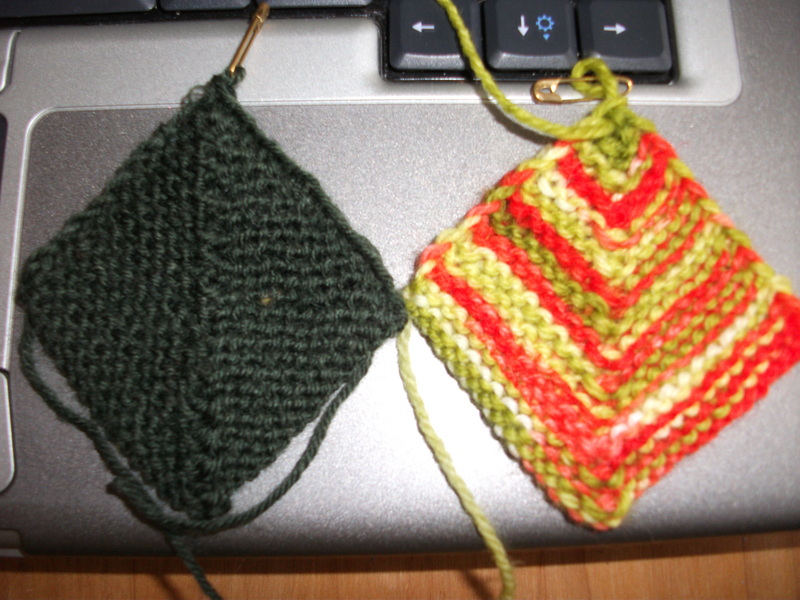 When I came to the end of the first skein I decided to stripe it, changing colors every other row. I had two light and two dark skeins. It’ll have to do. I’ve been working on a personal tag for a bag I am giving my daughter. I’ve had the front for a while and I finally got around to making the back with her first name. I put magnetic snaps on the strap because I’ve never used them before. If you’re lucky, I’ll have a picture of the completed project tomorrow. Then, maybe, I can start a Christmas table runner. I need to do something to get me in the mood. Nothing gets Cora in the mood, except, maybe, food. See that poor flower in the hanging basket outside? They all died the other night when it got below freezing for the first time. Can winter be far behind? It is so hard to believe that I was in North Dakota a month ago. I thought that this was an easy pattern. I should say here that I have been knitting for about 55 years so you can give me the fish-eye. The others at knitting group certainly do. There are charts to follow, but if you prefer your directions written out, they are there also. This makes the pattern four pages long instead of two. It is very well written and an advanced beginner could follow it. My goodness! I have finally figured out what an “advanced beginner” is. I have often wondered. I was busy. I didn’t feel like it. I had a little cold. I was too grumpy. Take your pick. Or, pick them all. And now for some good news. 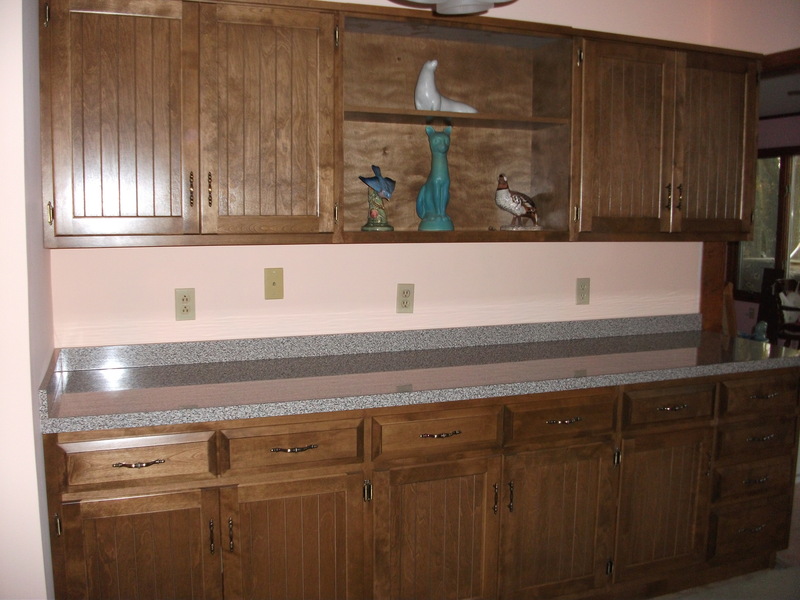 The new kitchen cabinets have been fixed and reinstalled. Sweetums has all ready taken all the hanging pots and pans down and put them away in drawers. However, he needs to learn that the heaviest ones do not need to go in the bottom drawers. He also took down the ugly, dirty rack. No one is in danger of getting hit anymore. The next thing on our list is taking down the wall. I hope it is in Frank’s repertoire. 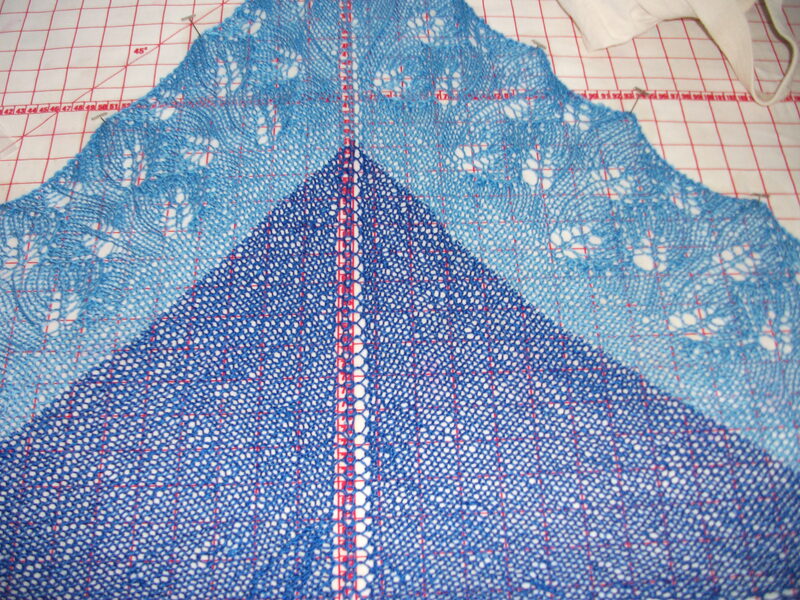 The tunic is finished. I need to wash it again before sending it off. I love this pattern. 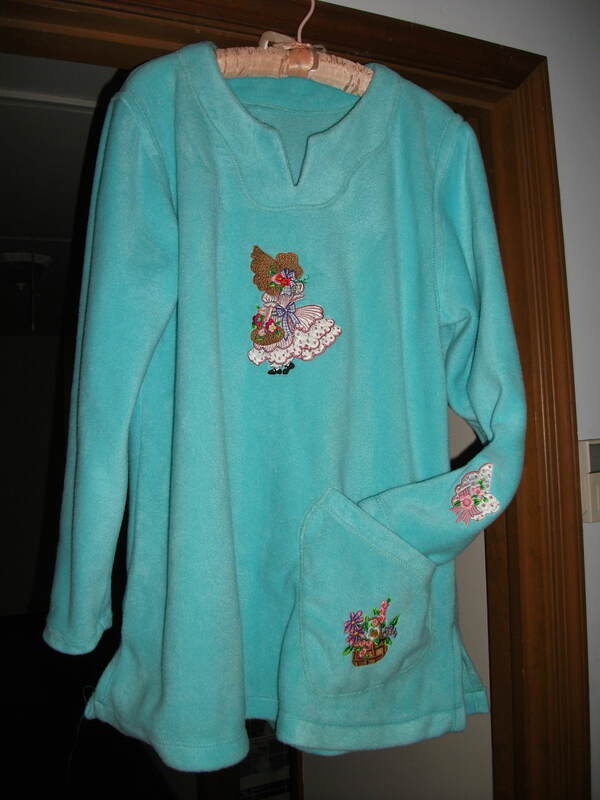 It’s so great for winter. I also loving having both my machines up and running at the same time. Making this garment took so much less time than the others that I have made. 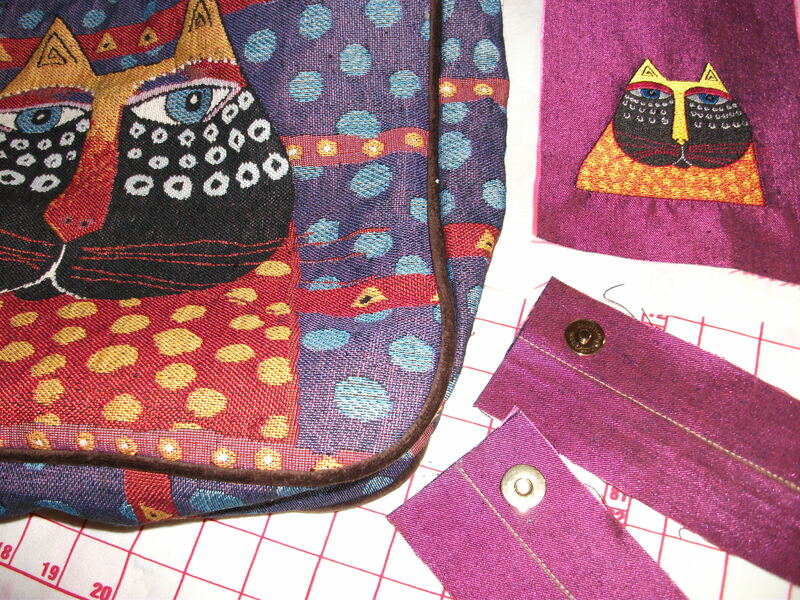 Sewing is fun again. The sign is gone and so are the horses, except for the one by the old house. The first barn looked empty. There was none of the horse paraphernalia around. All I saw was one young barn cat. She was all lovey. At first I thought she was in heat, but then I realized that she was lonely. She was used to having people around. I probably could have taken her home, but if I went anywhere with her, it would have been to the vet for a thorough physical examination. Even then I couldn’t bring her in my house until I knew the test results. Walking around the barn, I worried about the fate of the barn cats. There was another one sitting in the sun. When I looked is the second barn, I saw the bicycle that belonged to the old caretaker. I instantly felt better. I had often seen him feeding the cats. I felt that he would take care of them. I headed on down the drive to sit by the river. I opened a drawer and I found two old Colinette kits. They were similar in color so I decided to make a sweater out of mitered squares. 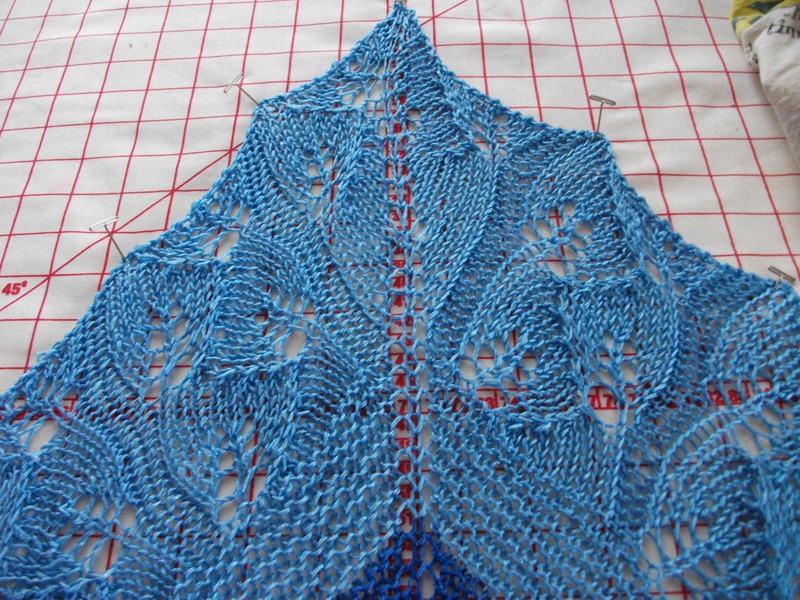 I think I may have a pattern somewhere, but for now, I am winging it. I am also thinking about a new hat. I haven’t been able to find most of my hats and I thought I’d use the rest of my last socks to make one. Here we have miters again. They are so much fun. I saw this pattern and I thought that it would be perfect for Jenn. 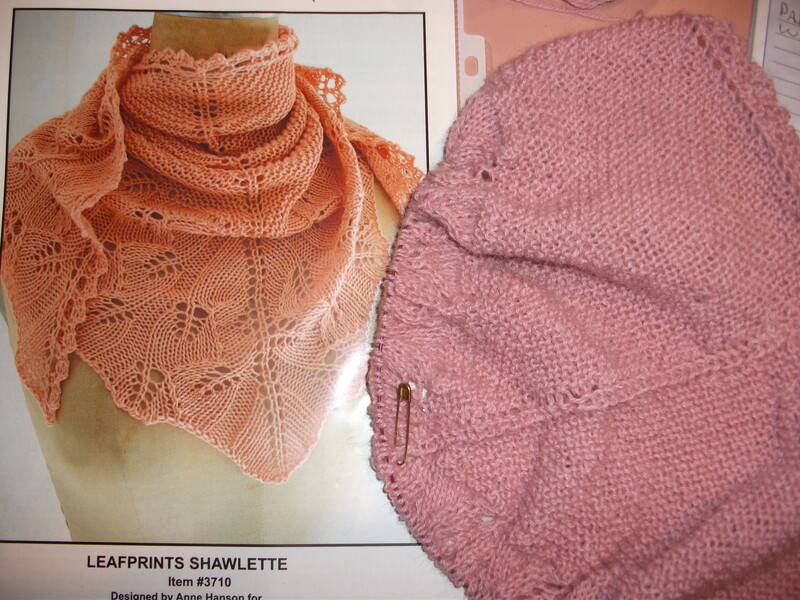 So far, I have only made one change(other than using different yarn than mentioned). 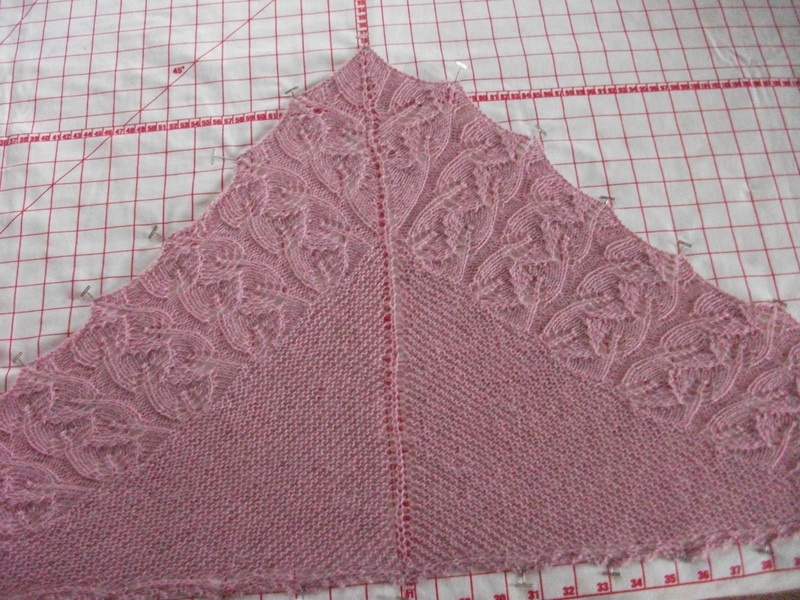 When going from the garter rows to the leaf pattern there is a row of yarn over increases which I found ugly so I made Make One increases–a much better looking increase. I am not certain that I like the pink I chose, but I can always give her two. You know, I still haven’t gotten around to posting my ND pictures. I should do that. Why is this message so important that it must be put on every programmable road sign when there is nothing to report? I was driving home to my beloved Delaware this morning and I was confronted with this no less than six times. I can understand having them announce an accident at a certain location, a road that is closed, high winds, bad weather and even slow traffic. But why can’t they be just left blank when there is nothing happening? And why this message? It’s a joke. It’s distracting. Here you are, heading home after a long day. You notice the sign and try to read it while trying to keep track of all that’s going on around you. You are expecting a warning and it’s the same stupid message. After a while, you just stop looking at it. It’s far safer to keep your eyes on the road. So what is the real need for these signs? I don’t get it. I couldn’t get a good connection yesterday and today I am pretty tired so this will be short. I got in about noon and I had things to do across town. I wanted to finish and get back to Reisterstown before travel got bad, but I didn’t make it and I found myself sitting on the beltway. I missed LSD. Today was better. We went to PA and Jenn drove. As usual we more than we planned. It’s a good thing we only go once a year. Tomorrow, it’s Girls Day Out. This is the new trash company in our area. Several months ago, we all got letters telling us how wonderfully cheap they were. They even went door to door and several people signed up. I am so glad we didn’t. We are naturally suspicious and prefer to ‘wait and see’. They wanted a signed one year contract and they are based in Maryland. These two things are equally offensive to us. And what do you get for this cheap price? They use old trucks that leak and beltch dark smoke. If they drop something, it stays there. Every Tuesday morning, there is all matter of trash on my street. I can definitely do without their services. I was going to blog. Really, I was. When I sat down with my laptop. my mind went blank. And what was I going to talk about? I’m still not certain. It was the first day of Standard TIme so I was up an hour earlier. I had time for a nice breakfast, a walk, some reading, some knitting and a long hot shower before leaving for knitting group. I still left early. I needed gas and I wanted to stop at Staples to get a book spiralled. Is that a word? I don’t know anymore. There are so many new ones out there. The stop at Staples was a waste of my time. They said it would be about an hour before they could help me and that I could leave my book. I said, “No thanks. I’ll be back in two weeks.” They said they were always very busy on the weekend. This is a lie because I always come on Sundays before my group starts. And the job they were doing? It seemed to be watching the customer operate one of the big machines. Huh? Group, as usual, was a lot of fun. I wore my new socks. I love them. They are so me. Betty started talking about my socks so I flipped my clogs off and pointed to my feet. She started laughing. She didn’t realize that I was wearing them. She’s one of those people who you want to make laugh just to hear her. 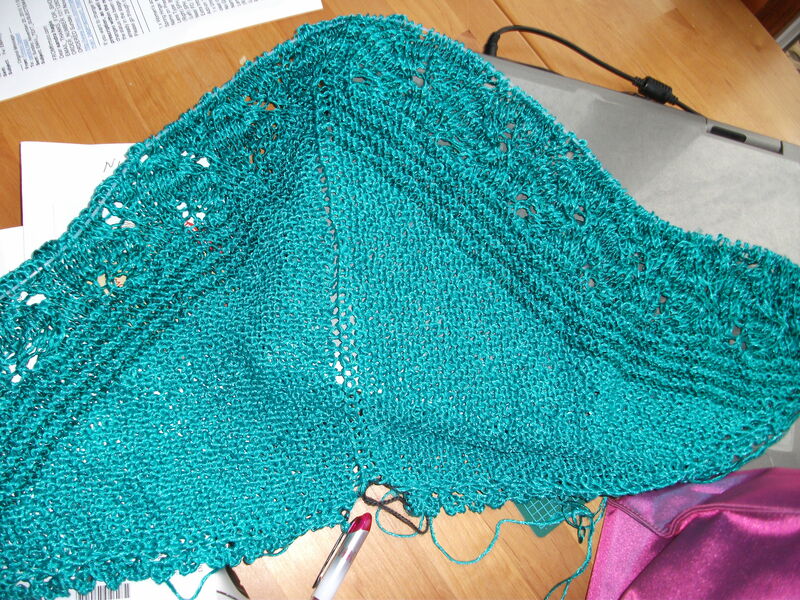 Maria made NO progress on the fringe of her shawl. She kept complaining that it didn’t look right. She kept losing the yarn overs. I hope I got her on the right track. I told her she can’t do anything new until she finishes the fringe. Fat chance of that happening. She’s all ready planning her next shawl and she has the yarn for it. I really like the pattern she found. Maybe I’ll do it, too. At this point I was going to show you what I have started. Unfortunately, my laptop and my camera are not on speaking terms with each other today. This has happened before, but I do not currently feel like fixing it. But there is always cat pictures. 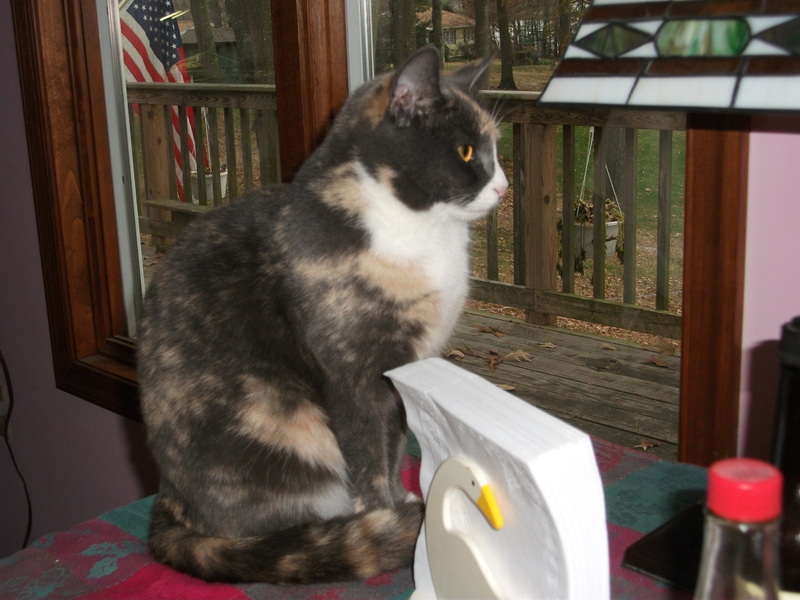 This is Miss Kitty. She is a Certified Bed Cat. 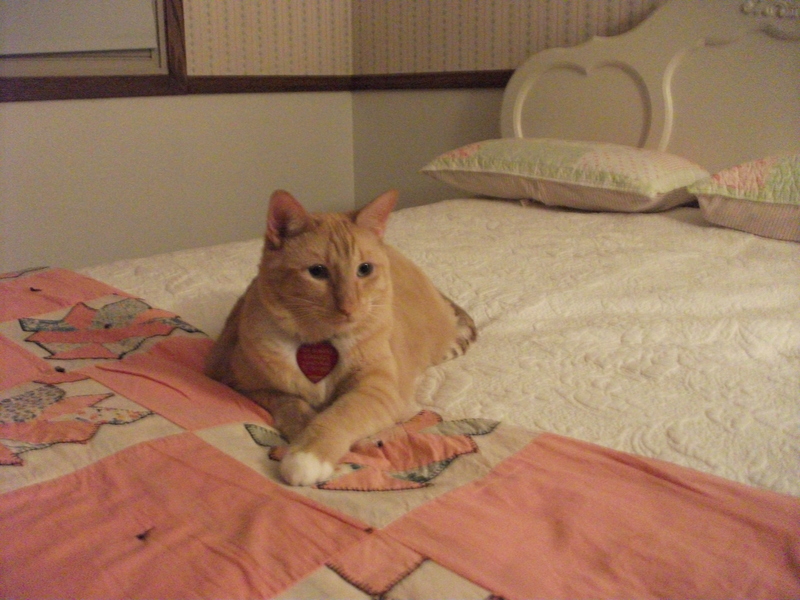 She will sleep with you every night when you visit my girlfriend in Bismarck. And, believe me, you need at least one of these when you go there. And here’s Flo. 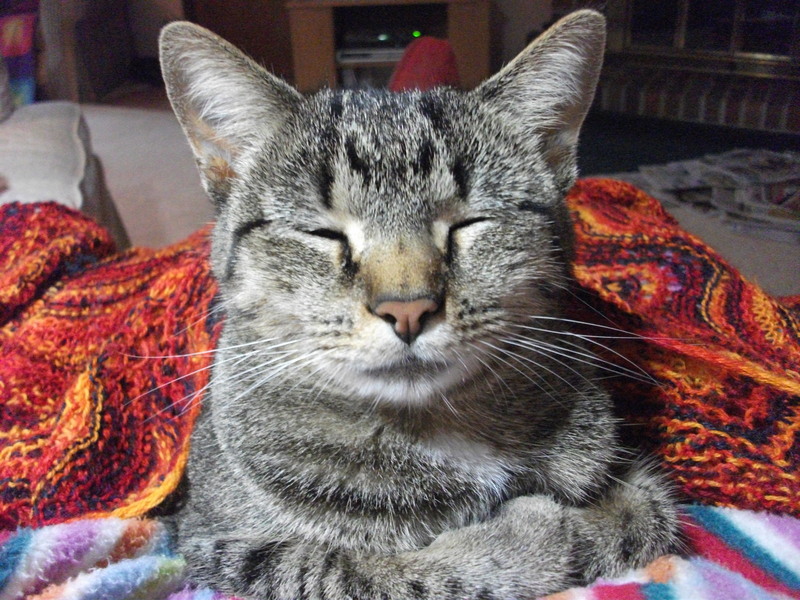 She missed my lap so much while I was gone. She’s been trying very hard to make up for it. 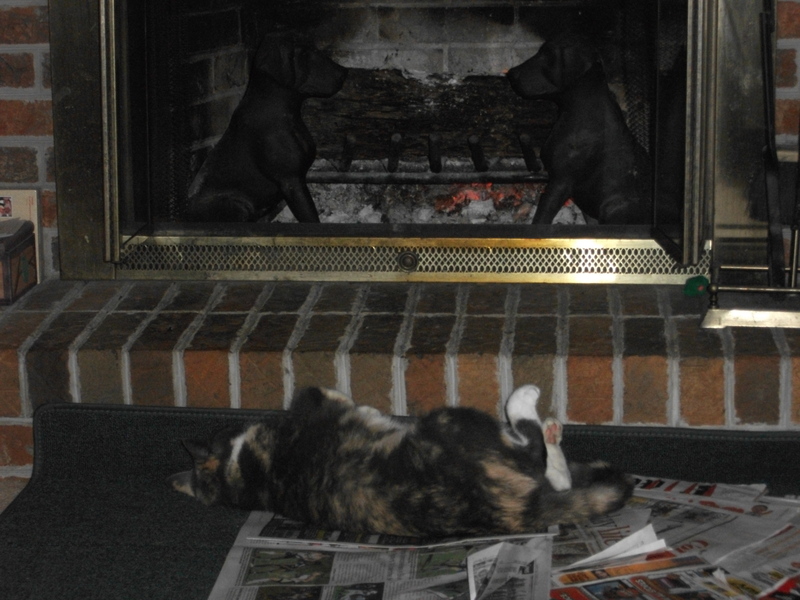 And here’s Cora enjoying the fire. She didn’t even realize that I was gone. These socks were a bit challenging, but well worth it. The instructions said to make your favorite heel with the main color, but I like a two color heel so that’s what I did. 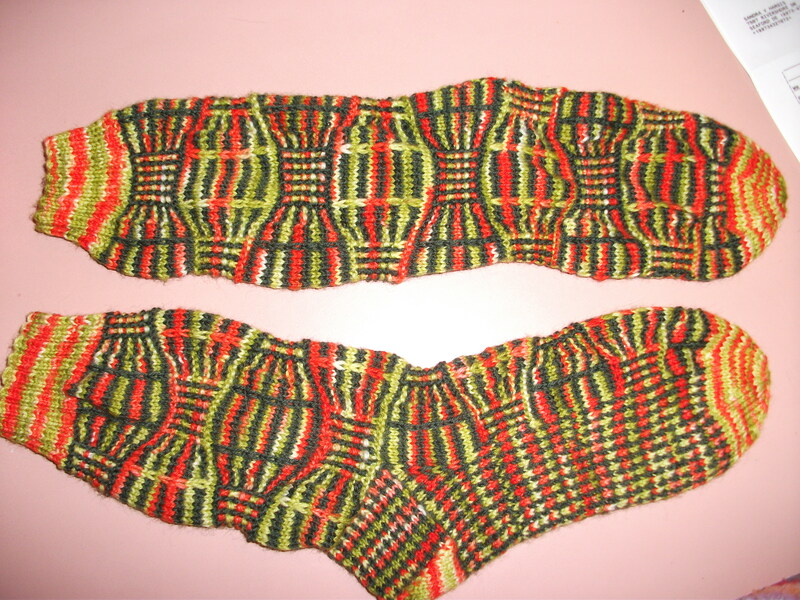 Originally, I was going to make the short row heel, but these socks were mostly made on my trip and I didn’t have my reference books handy. I should say that I didn’t have Lucy Neatby’s Cool Socks Warm Feet book. It has the best instructions. Montgolfiere is written by Stephanie van der Linden. 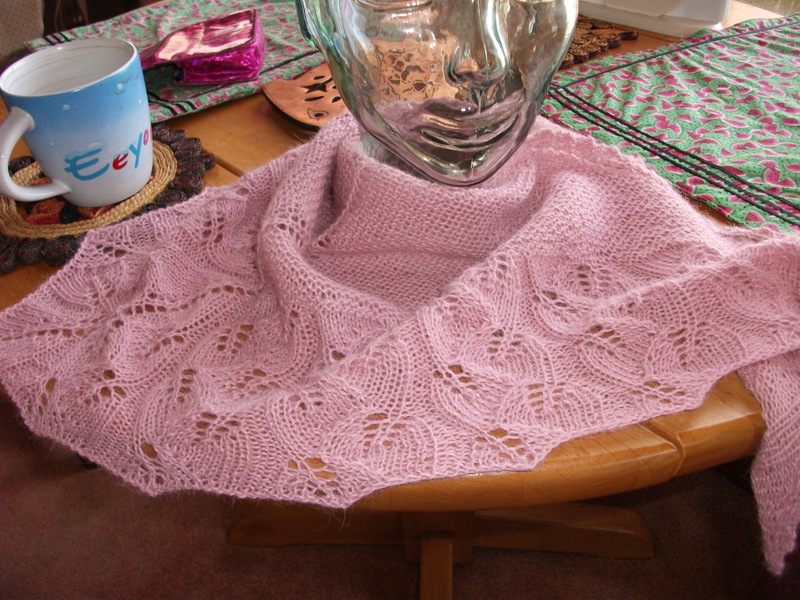 It is a free on-line pattern. At least I think it’s free. I printed quite some time ago. Here’s the website I found on the last page. I probably found it coming from the opposite direction so I’m not making any promises. She also has a new sock book that I love.